It has to be short tonight. I am sooo tired and exhausted and, yes, proud. Of myself, but more so of Pádraig’s friends. Those that ran today and those that were there supporting us. Here we are after the marathon. 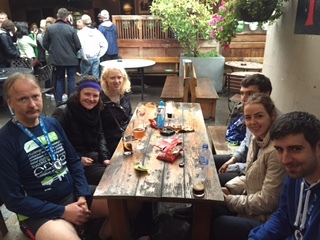 Thank you to Emily and Cliodhna for great company while running, and thank you to his friends for supporting us during the run. Also, thank you to all who supported Clíodhna and Emily who were fundraising for Pádraig! We all finished and had a great time! I am completely wrecked. But the fact that I finished proves that anything is possible! Congratulations to you all on running and finishing! (Reinhard, I just love your face in the photo above!) Speedy recovery to you all. So proud of everyone, absolute winners!